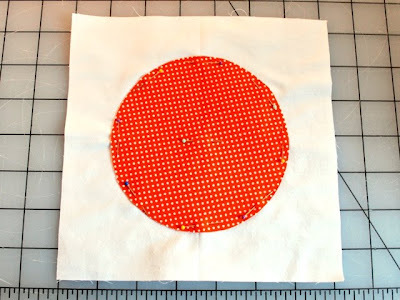 Bijou Lovely: the circle quilt tutorial, part one: creating your blocks. 40 the circle quilt tutorial, part one: creating your blocks. Thank you all so much for the wonderful comments on the circle quilt! It seems like there is an interest for a tutorial, so here it is. I'm going to split it into a few posts because there are a lot of steps. Step 1: Pick out your fabrics! Step 2: Iron your interfacing to the wrong side of one of your circle fabrics. 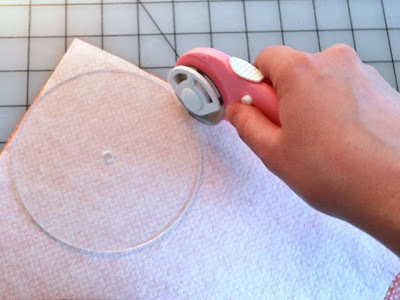 This will make the circles easier to applique onto your quilt, and it also makes the fabric less likely to fray. It's best to start in the middle of your fabric and work your way out towards the edges. 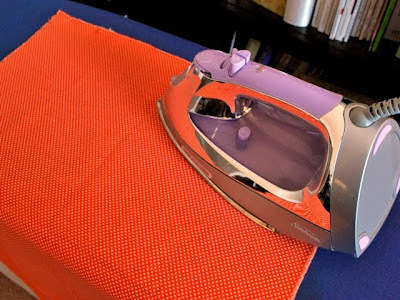 Press your iron down onto the fabric and then lift up and move to the next place rather than moving the iron around on the fabric. 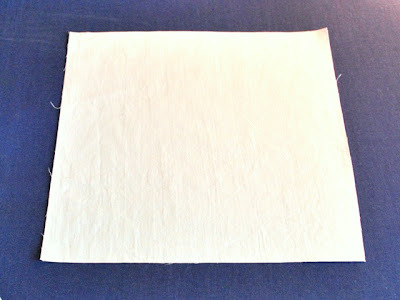 This technique helps prevent wrinkles and bubbling in the fabric. 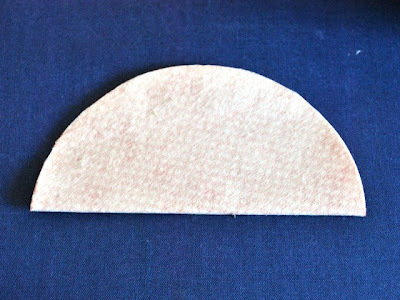 Step 3: Use a template or circle cutter to cut out a circle that is 5" in diameter. 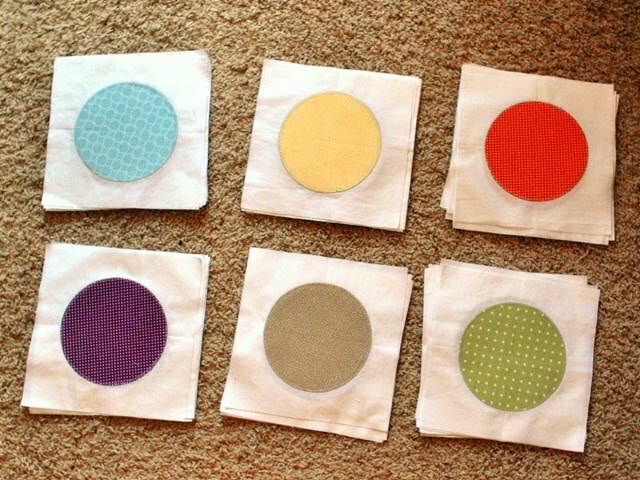 Cut out 8 circles from each fabric. Step 4: Repeat Steps 3 and 4 with the rest of your circle fabrics. You should have 48 circles when you are finished, 8 of each of the 6 colors. Step 6: Iron your circles and blocks. 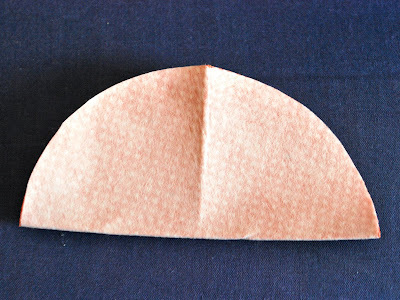 Step 7: Fold your circle in half and press. Step 8: Fold your circle in half in the other direction and press. 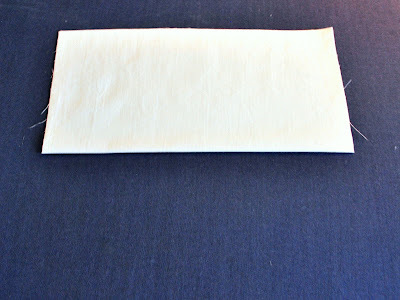 Step 10: Fold a block in half and press. Step 11: Fold the block in half in the other direction and press. Step 12: Repeat Steps 10 and 11 for all of your blocks. 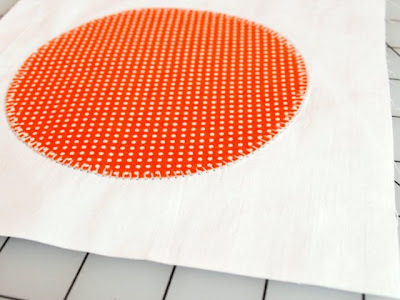 Step 13: Place your circle on top of a block and line up the creases to center the circle and press. Step 14: Pin your circle to the block. I used one pin in the center to hold it in place and pinned all along the outer edge. 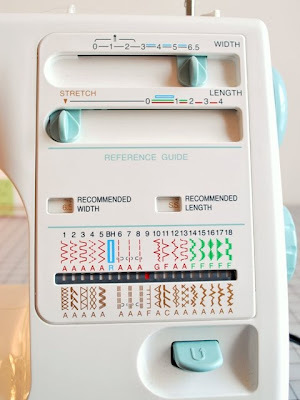 This may seem like a lot of pins, but it ensures that your fabric isn't going to go anywhere while you're sewing around the edges. No one wants a stretched out circle that more closely resembles an oval! 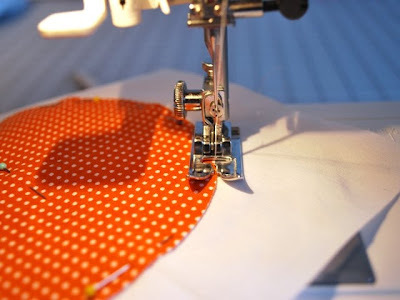 Make sure your pins all go in one direction so they're easy to pull out as you are sewing. Step 15: Repeat Steps 13 and 14 for all 48 blocks. Step 16: Now it's time to sew our blocks! I used a blanket stitch to applique the circles onto the blocks. A zigzag stitch would work as well. 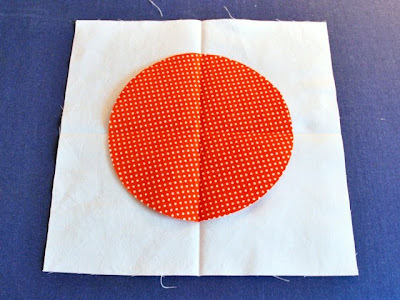 Step 17: Begin sewing your circle onto your block. Go slowly at first to get the hang of the turning. 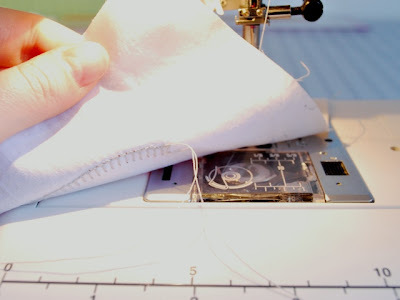 Your stitching doesn't have to be absolutely perfect since we'll be going over it again later, but it would be nice if it was close! 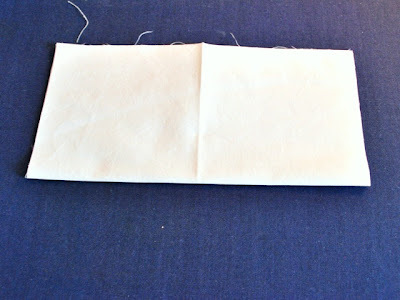 Step 18: Before you finish sewing completely around the block, pull your starting threads to the back. Continue sewing the rest of the way around, stop, and pull your end threads to the back as well. Tie threads in a knot and trim. Note: You can skip this step if you'd like and backstitch, but tying the threads looks a little cleaner. Step 19: Press your block. It's finished! Step 20: Repeat Steps 18 and 19 for the remaining blocks. Step 21: Take a break and admire your pretty blocks! There should be 8 of each color when you are finished, for a total of 48 blocks. Next, we'll assemble the quilt top and put it all together! Click here for part two of this tutorial. Note: I read this tutorial before making my own quilt, so several of the steps are the same, however the measurements and quilting techniques are different, and I've added a few steps for the beginner quilter (like myself). I've never made a quilt in my life, but I feel tempted now! 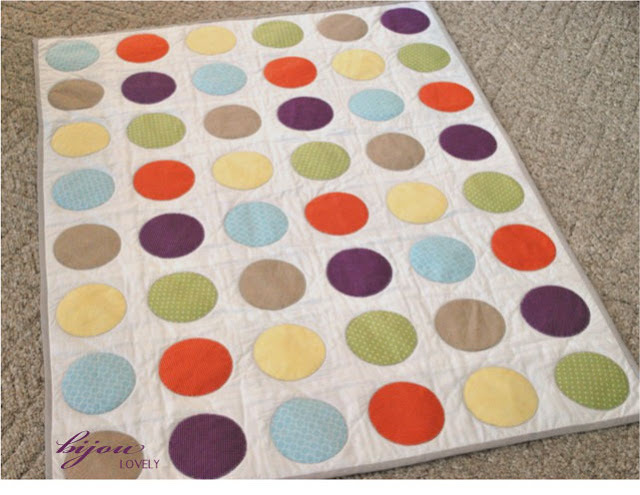 Your quilt is lovely: a simple design with the circles, but yet so effective! I love it! Thanks so much for doing this! I haven't gotten to starting my quilt yet, but this is so helpful! The ladies at the local store scared me with all the terminology when I asked for tips haha! I wish I had the patience and skills to make this quilt - it is so pretty! I'm doing this, thanks for the inspiration! Thank you so much for this! I am definitely doing it for a baby blanket for a cherished friend...Can't wait for the second half! Your effort and willingness to share is so much appreciated. That is an absolutely wonderful quilt, and I'm sure your friend will treasure it. (We DEFINITELY treasure the couple of handmade quilts/blankets we received as baby gifts....) And your tutorial looks so easy to follow. Someday when I have the time and space to sew again, I hope to give it a try! Beautiful job on the quilt and the instructions. I love to sew but have never been interested in quilts for some reason . . . they seem so fussy and time-consuming. 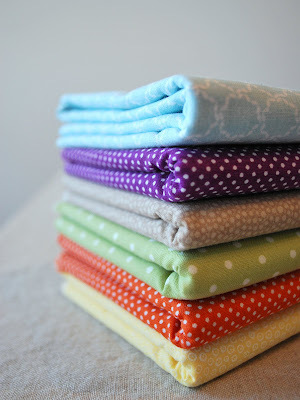 Your beautiful quilt appeals to me in so many ways: the simplicity and uniqueness of the design as well as the step-by-step directions you've posted make me want to sew it right away! Thank you so much for sharing this! Lovely quilt and tutorial! Definitely putting it on the to try list. This is fantastic! The circles are fabulous. I would love to link to this if you didn't mind. I'm not a quilter, but I think this quilt makes me want to give it a go and try for once! this is a really fabulous idea and very effective and gorgeous quilt - thanks for sharing. I really want to make one now and I've never made a quilt before, only every appliqued in my art! I am in love with this quilt! I am excited to make it. Thanks for the great tutorial. I think it would be fun to offset the circles toward one corner of the block and play with block arrangement. So, you've inspired me to make a quilt.. and now that I'm becoming an aunt - I'll be making this one! I just have one question... how much binding do you need? Also... is it okay to ask where you purchased your fabric, it looks great and I had a difficult time searching for fabric I like half as much as the ones you used here. Thanks! I have been wanting to make a quilt like this for a while and probably would have made it more difficult than it need to be. Thanks for the great tutorial! Can you tell me what fabrics you used? I love them. They are all so cozy looking. I love this quilt and am interesting in making a twin size. I'm fairly new to quilting and am not sure how to change the pattern to fit a twin. Is there an easy way to modify it? Oh, this is so lovely! I've have some Tula Pink fabric that I needs to be fussy-cut to highlight the cute animals, this will help me avoid the fussiness! Love this pattern! I have a question....is there a reason not to use the double-sided, iron-on interface so I can iron on the circles to the squares? I always use it when I applique. Thanks so much for your blog...great ideas. @Mimi - You can definitely use the double sided iron-on interfacing if you prefer! I was thinking of making a "quick version" of this quilt - using a large piece of white fabric background and sewing the circles onto it (carefully measuring and marking their location) - what do you think? BTW I am also thinking I could just baste the circles and then sew them on (quilt) when the batting is installed, rather than stitch them twice. Is there a particular reason that you chose the size to be 38"x50" instead of adding a row to each side so it would be closer to the crib-sized batting (45"x60")? Just curious...I've never made a quilt before, but I think I'd like to try yours as my first for my new son. Beautiful job! Thanks for the tutorial! Beautiful! I'm planning to attempt this one. Thanks for the great tutorial! Check your own grammer and spelling;). He was entirely right. This submit truly made my day. You cann't believe just how much time I had spent for this info! Thank you! Nice work, glad to have found this blog on blogs list. This is the kind of content that should be distributed around the internet. on web 2.0 list. It's a shame that the search engines aren't giving blogger. What a good tip about pulling threads to the back! Very clever. Very cute quilt, and I am sure baby will love it. I have a couple of questions. 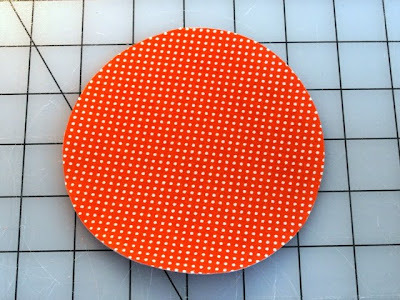 Instead of interfacing each circle, why not use a fusible web to fuse the circles to the background blocks, eliminating the need to pin? What's the benefit of not fusing? Also, why not ask that handy husband of yours to drill a hole in the center of your square template? When you're cutting squares, just put a pencil mark in the hole. Put a pencil mark in the hole of your circle template. Stab a pin through the two marks, and you've centered your circle on the square. No press marking needed!